Like reading, writing is not isolated to "English class;" instead, it permeates all of academics and professional life, and in this world of emails, blogs, and forums, personal life as well. It's not especially difficult to teach writing, but it's distressingly easy (even for a former writing teacher and professional writer!) to push aside writing for the content subjects such as math, history, and science. Your biggest task is to carve out enough time for the children to develop writing stamina; this is true whether you create your own program, follow a boxed curriculum, or help your children after school. The writing section of this book is divided into four chapters. This chapter explains the terms I use for thinking about writing, how to structure writing instruction across the curriculum and through the years, and describes a description of the invested writing process. "Writing Assignment Ideas" offers specific ideas on what kind of writing your students can be do once they've mastered putting words down on paper. "Writing and Revision Toolbox" pulls the ideas of the first two chapters together to give you suggestions to make to your students as they work through their writing assignments. Finally, "Writing-related Skills" is a chapter on penmanship, spelling, and keyboarding. Obviously, those skills are how we eventually transmit writing, but competence in writing and mechanical skills will naturally progress at different rates, and a lag in one shouldn't hold the rest of the process back. In my early years of homeschooling, I failed to use the words "writing class" when speaking to Helen and Anna. Every day in history class, they drew pictures and wrote summaries of the readings, and they did the same every couple of weeks in science, but I called that writing time "history" or "science." When I wanted to back off a bit on the summaries and have Helen and Anna work on longer piece of writing, they both felt it was unfair of me to add on an extra school subject. I'm not sure if it was a failure of nomenclature rather than teaching, or if they simply did not enjoy writing personal essays. Most children's writing books ask children to write about themselves -- do you remember writing "What I did Last Summer" pieces? -- but my children vastly prefered writing about history or science to stories about themselves, and while I think they probably would have benefitted from writing in more varied styles in elementary school, they have reached high school as strong writers. The structure that follows, however, can be used with personal writing as well as academic writing. There is nothing particular novel in my methods of teaching writing -- my ways of helping Helen and Anna develop as writers have a long tradition behind them. What is new, I believe, is the way I describe the different types of writing, emphasizing the similarities of writing across the curriculum, rather than teaching writing as part of "English Language Arts" and merely requiring the product in other subjects as is often the case in schools or homeschooling curricula. To teach writing in the early years, you need notebooks, pencils, drawing paper, and time. Between ages eight and twelve, you can add a computer and a printer. The program is essentially the same for all grades: high volume of writing to develop stamina and practice of the three main types of writing, which I call service writing, draft and a half, and invested writing. Service writing is a way of understanding and learning content. It can be used for any type of incoming information -- reading, lectures, book or field research -- or for outgoing information -- refining and developing ideas and understanding for one's own pieces of writing. Service writing is generally not meant to be read by other people and generally not revised (although parts of it may find a home in a piece of invested writing). Service writing can be coherent sentences and paragraphs, formal or informal outlines, sketches and diagrams, or or jumbled, exploratory ramblings. Draft and a half writing is exactly that -- the author writes a single draft and then polishes it slightly. We used to call these "one draft wonders" or "first draft finals" in school. They are not as good as they could be, but they are efficient, develop writing skills, and hone thinking. Most adult writing falls into the draft and a half category: letters, emails, daily news journalism, blogs, online discussions, reviews, tweets, memos, work reports, and so on. These types of writing are generally composed in one go, but now with computers, it is possible to write the text, and then spend time going through it on the screen, tweaking and adjusting, making sure that the words say what one wishes, and that the spelling, grammar, and punctuation are accurate. Finally, invested writing describes the lengthy projects that can occur at any age, where the author has significant investment in the writing, whether it be fiction, non-fiction, a research essay, or another format. Invested writing consists of writing multiple drafts, revising the work to make it as good as it possibly can be. (I don't consider a long-term project such as a blog as invested writing, despite the copious number of words it may contain, because the individual entries are usually not revised after they are posted.) I will discuss the general steps for invested writing at the end of this chapter. Many schools and homeschooling books stress either draft and a half or invested writing to the exclusion of the other, and most do not formally teach service writing. However, students need a lot of practice in all three types of writing. Each style feeds into each other -- every word written counts, just as every word read counts towards making better readers -- but a thorough program will train students in each of the three ways of writing instead of relying on transfer from one favored style to the others. Three of the books that I recommend for learning about studying and writing are William Armstrong's Study is Hard Work; Gregory Colomb and Joseph Williams's revision of Kate Turabian's Student's Guide to Writing College Papers; and Peter Elbow's Writing with Power. To write well, you must think correctly. You cannot hope to write clearly unless you first have clearly in mind what you are going to write. Before you attempt to write anything, even the the answer to the simplest question on a daily quiz, you must have something to say. Have you ever heard the tale of the one-draft wonder? That's the student who starts writing a paper at midnight before the deadline, knocks out one quick yet perfect draft, and then receives the best grade in the class. The one-draft wonder is one of the more enduring school-based urban legends . . . but we've never seen the real thing. They're all three completely right and completely wrong (and, I suspect, they developed their theories of writing before composing on a computer was commonplace). There is a time and a place for both kinds of writing, and both are supported by service writing, as explained in Peter Elbow's Writing with Power. Thought he doesn't use the term, the author, known to his students as "Write-it-Wrong Elbow," uses service writing extensively in developing writing. He is certainly an advocate of invested writing, but he is open enough to admit that sometimes writing needs to be done in a hurry: a draft and a half. [H]ow do we encourage excellence? There is no sure fire method, but one thing is clear: we have little hope of producing excellent writing unless we write a great deal. Plenty will be bad. If we want lots of practice and experience, we can't limit our writing to times when our mind is operating well, [n]or can we write a lot unless we get some pleasure from it, and pleasure is unavailable if we wince at everything bad that comes out and stop and try to fix it. If we write enough, we will have at least a chance of producing some excellent bits. There is a fine line between draft and a half and invested writing. Many draft and a half essays could easily be worked into a longer or more involved piece of writing, many of the prompts that work to start students off in draft and a half writing assignments work well as invested writing topics. I do find that invested writing projects work better if the topic comes from the student himself, rather than an outside prompt. But some students figure out paper topics with ease, and others spend valuable writing time tearing their hair out trying to find the perfect topic. I'm not shy about nudging topic finding along if necessary, and sometimes that means resorting to writing prompts. In elementary school, I let invested writing happen organically -- if there was a topic the children were interested in developing further, then they did, if not, they moved on to something new after a draft and a half. As a very loose rule of thumb, students might be encouraged to write as many multiple draft essays (of any style or subject) as their grade in school -- four essays for a fourth grader, eight for an eighth grader, and so on, but that is a flexible guideline -- if a student is putting a tremendous amount of work into one project, then that project could easily count for two or three of those essays. The grade/essay number requirement would be better used to encourage reluctant writers and to curb (slightly) very enthusiastic writers, who might write dozens of draft and a half pieces, but never slow down to bring any of those papers to their potential. By middle school, I explicitly assigned draft deadlines and "final deadlines," usually a week later, so that there were a specific number of pieces of a year that had gone through at least a draft and a half (or maybe even two draft) process. However, because I use portfolio evaluation (discussed further in the next section) that "final deadline" may not be the end of the writing process on a particular piece of writing. With fiction and non-fiction essays, research papers and so on, students often benefit from some time off -- after they have worked on a piece for several weeks, they may find it helpful to put it aside for a month or two, and revisit it when preparing their end of term or end of year portfolios. With history essays, however, Helen and Anna tend not to be interested in revising them at a later date because we've moved on to a new century in our study of history. Any additional work they do for the portfolio version of their history papers tends to be line by line proofreading and editing, rather than a true revision of the ideas and structure of the essay. A strict invested writing / portfolio evaluation classroom would not require intermediate "final" drafts of the papers, and only require the portfolio, but I think it is good practice for Helen and Anna to turn in the papers that are merely draft and a half, because it gives them experience of deadlines and polishing. We also found that if the assignments were too open-ended, the writing would be pushed aside by other subjects with daily assignments, such as math, history reading, or science experiments. As you go through other homeschooling books, or perhaps your boxed curriculum or children's homework, you'll find a host of terms for writing that I don't use, because I find them artificial distinctions. You may need these terms, however, in order to craft an evaluation or report to local authorities. Schools and commercial writing programs divide writing into genres -- for example, the Common Core uses the genres "narrative," "informative/explanatory," and "opinion," which is upgraded to "argument" in the fifth grade. When most school teachers and standards writers use "narrative" they mean a fiction or non-fiction piece of writing that describes characters and events. In the real world, narrative fiction is called short stories, novellas and novels. Narrative non-fiction makes up the rest of our pleasure reading: biography, autobiography, popular histories, true-life adventures, and informative books about specific subjects. Schools divide the world of non-fiction into narrative and informative/explanatory, but published books do not -- there are usually elements of both, and probably some opinion and argument as well in every non-fiction book. In most homeschooling books, however, narration means something quite different. Charlotte Mason, a British educator in the early twentieth century, uses the term to mean a child telling back a story after hearing it read (either by dictating to a parent or writing it down). I will instead use the word summary to describe this sort of writing, and I class it as a kind of service writing to support reading comprehension and retention. After stamina and explicit training in different types of writing, the third element of my writing program is portfolio evaluation, which takes the pressure off writing and allows children the chance to experiment and explore. Letter grades or even the simple check, check plus, check minus on returned papers discourages experimentation and the wobbly "I'm not sure what I think yet" writing that is so important to students' development as both thinkers and writers. With portfolio evaluation, students themselves choose the best pieces of writing -- usually invested writing, but it doesn't have to be -- from the school year or semester, and spend a couple of weeks revising their work for the portfolio. Students learn to be selective and judgmental about their work, making decisions about both what writing is the best now and what writing has the most potential. Saving the grade or evaluation pressure for the portfolio frees students from perfectionism during most of the school year, which gives them a chance to experiment and bring out the best in their writing. A portfolio can be as simple as three cleanly written (or computer printed) papers turned in at the end of the school year or as complex as an illustrated book, with a sewn or commercially-made binding. Once we moved to Alaska, our homeschooling was far more supervised than in earlier years, and Helen and Anna turned in portfolios four times a year, in the form of PDF documents emailed to their contact teacher. This was about twice as often as I would have chosen for myself -- the preparation of each portfolio took a full week of school time, or a month a year. If I were evaluating portfolios without any responsibilities towards outside teachers, I would assign a final portfolio once or twice a year, probably twice a year in order to keep a little bit of pressure on (a whole year's assignment can seem too long at this age). If the students were self-motivated, once a year portfolios could certainly work. Because of the four deadlines in Alaska each year, there is less true revising than I would like for each one. As a result, writing contests rather than portfolios have served as deadlines for revision, and I encourage Helen and Anna to enter writing contests several times a year. That is a great way to focus their energies, and occasionally earn some outside recognition for their work. I am convinced that we overvalue feedback and undervalue practice. . . . Volume, to be sure, does not equate with quality, but young writers can't get to quality without volume. The good writers I see in college have often developed their skill in self-sponsored writing projects like journals or epic, book-length adventure stories they wrote on their own. As with reading, writing is about building stamina, gaining experience in different kinds of writing, and giving time to write high priority in scheduling school. Writers learn to write by writing, not by completing workbook exercises. Avid readers develop intuitions about form, language, dialogue, voice, levels of formality, genre -- indeed, I firmly believe that many of the 'mechanical' skills like spelling and punctuation are fostered more by reading than isolated skill work. We learn a writing vocabulary by seeing words in context where we can see how a particular word is used with other words. It is a truism among writing teachers that not all good readers are good writers . . . but all good writers are good readers . . . .
My goal for Helen and Anna's writing has been roughly one hour per day, minimum. The advantage of homeschooling is that you can spread the load, because you know exactly what the teacher is assigning in each subject area. Writing assignments can be in the subject areas (history, science or literature) or as pure composition assignments. If a student is working on a self-motivated writing project, you could drop writing assignments completely. Anna went through a phase where she worked for a couple of hours a day on a Lord of the Rings fan fiction story. She published it online at a fan fiction site, and she was very motivated by the reviews and comments from readers. In addition, she learned a great deal about writing by reading other people's stories -- learning what made them great, what made them awful. During this phase, I didn't assign her a single invested writing project. She still had the responsibility of doing her subject area service writing, but I spent my time working with Helen and let Anna write her story undisturbed. Every word counts towards making students better writers. When I do assign writing projects, it turns out that almost every paper becomes a research paper of some kind. They may start out with a personal narrative style paper, but the world intrudes as the draft develops. For example, Helen wrote an early draft about the litter in the water in Kosrae in the Federated States of Micronesia. In the beginning, it was a personal essay, but it turned into a huge research project about the Pacific Gyre, the problems of Laysan albatross feeding plastics to their chicks, and the length of time different garbage items persist in the environment. I wish I'd emphasized creative writing more in elementary school. This is one of the cases where I relied too heavily on homeschooling guides and not enough on teaching guides. The few teaching guides that I looked at were simply discouraging: perfect child after perfect child composing away, and I couldn't figure out how to get started. Instead, I concentrated on history and science service writing and let letters home suffice as personal narratives until about the fourth grade. This doesn't seem to have had any ill effects on Anna's enjoyment of writing, but I think Helen would have benefited from a more rounded program. With everything else going on in early homeschooling, invested writing was the subject that would be pushed aside for other things. I bought the Writing Strands books two and three, but when Anna's first writing assignment was to describe a yellow pencil, I put them quietly on a shelf. It could be helpful to look at Writing Strands (maybe skip the yellow pencil assignment) if you are nervous about teaching writing, but I found Donald Graves's book Writing: Teachers & Children at Work to be far more useful in structuring a writing program -- there are even some examples of children who don't like to do their writing, and wander around the classroom disrupting others, although all of the examples do seem to work out in the end. Donald Graves describes writing as a "craft." The more a student writes, the better, but it must be writing, not worksheets on correcting sentences, grammar, or spelling lists. Graves suggests that "at least four forty-five to fifty minute periods [per week] are necessary to provide a strong writing experience." What is writing? In the earliest grades, it can be a story-drawing, with with or without letters on it. By the end of grade four, students should be familiar with going through a multi-draft process, and choosing their best work to put into a portfolio. By fourth grade, the work in the portfolio should be hand-written or typed by the student, but in the early years, it can be dictated to a parent or an older sibling. My real failing in the early years of our homeschool was not to model writing for them. I had never seen a teacher write in front of me, so it never occurred to me that it would help. Donald Graves wrote about the importance of teachers writing in front of their students back in 1983, but it was all news to me. I've since tried it, and it really works. You mustn't worry about not being a "good writer" or a "good teacher" -- you're the best writer in the room. Graves writes, "Teachers don't have to be expert writers to 'write' with the children. In fact, there may be an advantage in growing with them, learning together as both seek to find meaning in writing. However, it does take courage to show words to children who haven't seen an adult write before." Let them see the struggles over topic choice, structure, and ideas. Here are some steps to move through the parts. The speed (and even the order) at which you move through the steps will depend very much on the individual child. Most students start with story drawings, perhaps with a few letters or words around them. Story-drawing is a typical first step, but it isn't necessarily an immature one; look at Art Spiegelman and the Maus graphic novels. In More than Stories, Thomas Newkirk observes that these story-drawings are not mere "rehearsal" for writing, but rather adoption of the picture-book genre. In history writing, I explicitly assigned these drawings in the first grade. I read them a chapter from Susan Wise Bauer's Story of the World and asked them to illustrate the story. Anna will never forget the second "defenestration of Prague," after drawing a huge pile of manure, with four booted feet sticking out and two flies buzzing past. I next asked for a picture and a dictated caption; later, as handwriting became easier, Helen and Anna began to write captions. By third grade, they were writing half-page summaries of the history readings without any prompting. In the early days it was helpful to have them start from an illustration in both the history service writing and creative writing. On a photocopier, I made them writing paper half lined and half blank with the idea of encouraging the drawing and writing connection, but I think I may have persisted with this too long. It worked well for history, where I wasn't concerned with them writing multiple drafts, but in creative writing, having the illustration and the writing on the same page backfired. They didn't want to edit the writing because it would mess up their drawings. By dictation, I mean when a child who can't quite print or write well enough to capture his ideas dictates a fiction story, non-fiction essay, or summary of reading to a parent or sibling, who takes it down in clear printing or handwriting. We used this method a lot, both before and after Helen and Anna were ready to try some words on their own. It let them see themselves as writers, as producers of ideas in written words, before they could easily write, which gave them added motivation to work on the tedium of penmanship, and perhaps more important, gave them an extra year of practice in writing, by which I mean composing and discussing ideas in words, rather than the mechanical skill of putting them down on paper oneself. 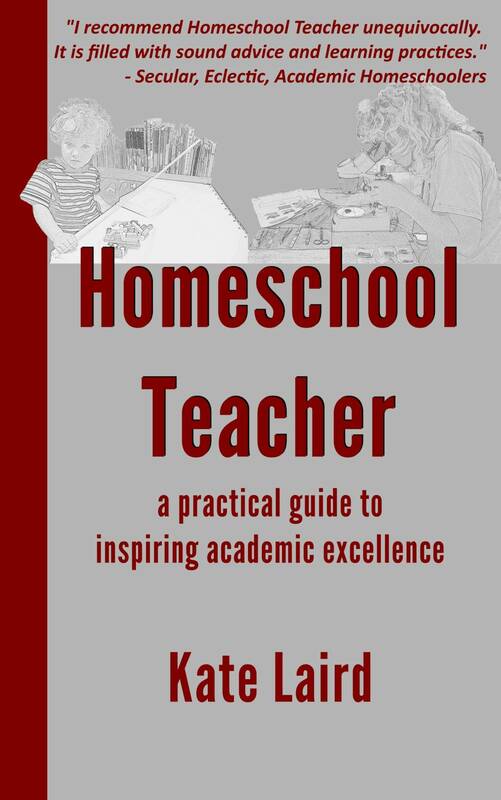 It's easy for homeschooling teachers to take the dictation of a paragraph a day -- here is another area where homeschoolers have a distinct advantage over a classroom teacher with two dozen students. Afterschooling parents can easily fit in taking a short dictation from kindergarten and first grade students, to illustrate drawings, or tell a story. Many dyslexic children have found success by using a computer dictation program such as Dragon Dictation to take down their words. I tried this with Anna in grade three when she was having a great deal of difficulty with the mechanics of writing, but it didn't work well with her hybrid English-American accent. By fifth grade, she was touch typing, and began doing all her writing on a computer, which solved the problem of the mechanics of handwriting. A dictation program that recorded words in the Dyslexie font might work extremely well for some children, particularly if they had the patience to work with learning the program (and have the program learn their style of writing and speaking). Some homeschooling books advocate having the parent read aloud to the child who takes the dictation, so the term dictation can be a bit ambiguous. We tried that direction of dictation, but it wasn't helpful for us. Helen and Anna were both better off working on their own writing once they reached the stage of being able to write legibly. Taking dictation doesn't help with the "silent errors" of grammar discussed in the "Writing and Rewriting Toolbox" chapter, so teacher to student dictations end up being an exercise in error-marking. Homeschooling books lured me down this path for a while, but I eventually retreated to find a more constructive way of teaching writing. A page festooned with grammar and spelling corrections merely gives students the conviction that they are bad at writing and doesn't give them the tools to improve. Individual writing is when the child writes the words himself, using invented spelling where necessary. Don't worry about spelling at this stage. If you have begun using a spelling program, don't be concerned if the paper writing is not up to the same standard as the spelling tests. Encourage the child to skip lines, to leave room for additions and changes. Provide plenty of paper for drawing alongside writing, but encourage revision by keeping the two separate until the portfolio stage. The following graph is a rough guide to writing across the curriculum in the later grades, once a student is writing individually. This list highlights the similarities between writing in the different subjects. In schools, writing is typically divided into subjects of "English Language Arts," "Social Studies," and "Science." Homeschooling allows you to break writing into more categories, and what is usually crammed into "English Language Arts" is instead divided here into five sections, personal-memoir, personal interest (often including subjects that would normally be taught in a Social Studies curriculum, such as current events and argument), fiction, poetry, and literary. Although it's usually combined in one "English Language Arts" class, literary writing actually has far more in common with the other subject matter writing such as history and scientific writing because it involves understanding and analyzing events outside the self, what could be called world-referential as opposed to self-referential. In the case of literature, this can be writing about other people's novels, poems, short stories, and plays; in history, this means historical analysis (of general interest books and text books) and summary and analysis (of original sources). Science writing about others' ideas and researched-based writing falls into this category. When I taught English 401, the required introductory writing course at the University of New Hampshire, I'd already taken the course four times. UNH was a pioneer in the teaching of writing as a process. Led by professors like Don Murray and Donald Graves (you will hear them mentioned in nearly every recent book about the teaching of writing), the English department at UNH studied teaching in local classrooms, experimented on their own students in English 401, and developed a program that has been emulated throughout the country. This is in marked contrast to the old school style of teaching writing, where the teacher assigns the topic, the student thinks about it for a bit, develops a thesis sentence, writes a formal outline of the paragraphs (usually five) of the paper, and then follows the outline to write the paper. Because the thinking has happened (or hasn't, as is often the case) in the outline, the writing time is seen as the final draft, with attention and time given to choosing the right word and the right spelling and punctuation from the start. This paper is turned in, and the first teacher/student interaction is the teacher returning the final draft, with every spelling and punctuation error carefully marked in red ink and a grade on the bottom. If the grade is high, the student normally keeps it; if the grade is low, it usually goes in the trash. As with math or music or reading, there are some students who have an initial talent for writing and do very well in this system, but the main thing about this method is that it is fairly closed. Most students will either do well at it or they won't, but there isn't a lot of opportunity for students to improve from one paper to another, because the only thing that is under consideration is their final product. Students were not taught how they might improve their techniques and practices. Don Murray changed all this. The idea of the process of teaching writing seemed novel in the 1980s, although similar ideas had occasionally risen in past centuries. Murray, in particular, examined his own process and habits of writing, and looked at the steps that he took to create writing. The "Process Approach" splits writing into three rough phases (with writers shifting back and forth between them, rather than always taking the straight route through the steps). Different books use different words to describe the three steps, but they usually fall into the following categories: early writing, drafting and revision, and line-by-line editing. I cannot take credit for these ideas -- this is my tuning of a process that has come to me and that I've worked with, but the ideas initially belonged to Don Murray, Donald Graves, Tom Newkirk, Bruce Ballenger, Nancie Atwell, Peter Elbow, Penny Kittle, Kelly Gallagher, and of course my father, whose writings and revisions went on all around me. It is impossible to believe that writing springs full blown from the writer when your childhood was surrounded by reams of paper revisions. Back before computers, my father's earliest drafts were written with a black Flair felt tip pen on legal pads, with a plywood off-cut as a lap desk. The next draft was at the typewriter, on yellow typing paper. Several drafts of yellow paper might ensue, and my mother would read them, and then finally, my mother would get out her red and blue pencils and copy edit them for spelling and punctuation, missing words, and misunderstandings. Here is my take on the stages of the writing process. I say "stages" because I do think of them as a progression, but I never march directly from point 1 to 2 to 3 in my own writing -- the real steps loop around, sometimes progressing neatly down the track, sometimes going over and over old ground, until the final piece usually looks absolutely nothing like the ideas in the initial early writing stage. Each piece of writing is different -- there is no particular virtue in following the steps one by one, although students need to know that successful writers do go through these steps. Sometimes it seems that the steps are not remotely linear, but rather a loop, from early writing to research to draft, around and around, until a gravity sling shot (or more usually a deadline) shoots it out of orbit and into line by line editing and completion. As you read through my list, keep in mind that this process could take five years, five weeks, or a few hours, depending on the complexity of the writing project. Invested writing will go through many drafts, and hit most of these stages; draft and a half writing rushes through them in a day or so, and skips out most of the revision stages, although writers may use some of the early writing steps to generate ideas and structure. I call the first stage early writing (which I prefer over the often-used "Pre-Writing" because usually quite a bit of writing takes place in this stage, even if no word of it appears in the final draft.) Often times, in what I call service writing where the student is using writing to help cement ideas, the whole writing project might exist in the confines of the early writing section. The second stage is drafting and revision. Usually, the first draft is done rather quickly and is more of an exploration, where the author fine tunes his ideas as to exactly what the paper is about. If outside research is necessary, it takes place during both the first and second stages, as the subject is developed through the early writing and first draft. The earliest draft revisions will concentrate more on the ideas, and the later drafts on the language. The final stage is the line by line editing where the author is concerned with her specific word choice and revising at the sentence level. (There is no point spending hours writing a paragraph perfectly in draft two if it gets cut in draft three.) Once the word choices are clear, then the author can go through and make sure that the spelling, punctuation and grammar are all accurate. • What do you know about the topic? • Where can you find that information? • What is your main idea? • What are your secondary ideas? • Where do you want to go next? • Read through your notes. Is there anything that should be in your draft, but isn't? • What do you still need to know? • What works in the first draft? How can you expand on that? • What is the main idea? Has it changed in the drafting? • Do you need any more research? • Is it clear? Have you made any scenes vivid and strong? • Read what you've written, not what you wanted to write! In terms of this list, the final line-by-line editing takes up the most space, but that is not where the work happens; it's merely easier for me to be more specific about what needs to be done. Different pieces of writing use different percentages of time to capture these steps (and some seem quite endless). Perhaps the biggest difference in the "Process Approach" compared with the "Product Approach" is that the writer is not expected to know the thesis sentence when he or she begins writing. Writing is an intrinsic part of learning, rather than a triumphant demonstration of what one already knows. This helps cut out much of "writer's block" and the negative "I hate writing; I'm just not good at it" outlook which often comes from being required to know where you're going before you start. Stuffing the writing process into an outline (which is one of the things this approach is trying to escape) is in some ways antithetical to the whole idea of the writing process, but I am merely providing it as reference. I do not recommend providing elementary school students with this list and sending them on their way; rather, I provide it as a list of suggestions for the teacher to make as the students learn to write. 1. William H. Armstrong. Study is Hard Work. Second Edition. Boston: David R. Godine, Publisher, 1995, p. 79. 2.Kate L. Turabian. Student's Guide to Writing College Papers. 4th Ed. Revised by Gregory G. Colomb, Joseph M. Williams, and the Univ. of Chicago Press Editorial Staff. Chicago: Univ. of Chicago Press, 2010. P. 24. 3. Peter Elbow. Writing With Power: Techniques for Mastering the Writing Process. 2nd Edition. New York: Oxford UP, 1998. Location 123. 5. National Governors Association Center for Best Practices, Council of Chief State School Officers Common Core State Standards English Language Arts & Literacy in History/Social Studies, Science, and Technical Subjects. Washington D.C.: National Governors Association Center for Best Practices, Council of Chief State School Officers, 2010, 19-20 & 42. 6. Thomas Newkirk. Holding on to Good Ideas in a Time of Bad Ones: Six Literacy Principles Worth Fighting For. Portsmouth, NH: Heinemann, 2009. Kindle Location 1351. 7. Newkirk. Holding on to Good Ideas. Location 2383. 8 . Donald Graves. Writing: Teachers & Children at Work. Portsmouth, NH: Heinemann Educational Books, 1983. P. 90. 10. Thomas Newkirk. More Than Stories: The Range of Children's Writing. Portsmouth, NH: Heinemann, 1989. P. 36-37.